Live blog from 1pm, live scores and reports on RTÉ.ie and the RTÉ News Now App. 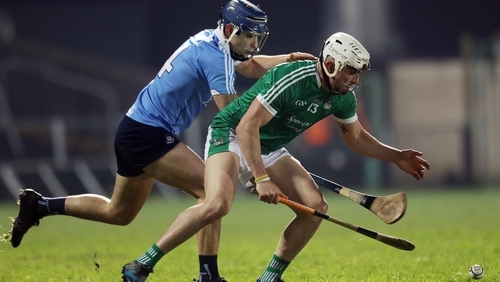 The home of Kilkenny hurling won’t witness the Cats in action, but while the Cats will be in a watching brief for the double header at Nowlan Park, the hurlers of Dublin, Limerick, Galway and Waterford will be looking to add to their body of work ahead of the looming Championship. First up on Sunday is the meeting of the All-Ireland champions and Mattie Kenny’s Dublin. John Kiely’s side are seeking to take both Liam MacCarthy and the league trophy into their possession and based on their form to date, are favourites to account for an improving Dublin side. The Shannonsiders topped 1A after winning their opening three games before a gallant fight back against Cork in round four was that little bit too late. Laois were easily accounted for in the quarter-final and while they have impressed all over the field, Aaron Gillane and Peter Casey (pictured above) up front have sparkled, claiming 2-44 between them to date. The men from the capital will have to be pleased with their campaign to date. The departure of Pat Gilroy was further managerial upheaval, but Kenny has the team humming in the early part of the year. They topped 1B, though it was the games against Galway and Waterford which were always going to be an indication of where they are at. A 50% return isn’t bad, a six point defeat in Pearse Stadium balanced by a shoot-out win against the Deise a week later. Better was to follow in last week’s quarter-final in Thurles when they claimed a first win over the Premier County on Tipp soil since 1946. Oisin O’Rourke’s accuracy from placed balls, along with Donal Burke and Eamon Dillon’s contribution from play has been key, but with Eoghan O’Donnell and Seán Moran holding down the central defensive positions, the Dubs should give the Treaty men a much better game than their 12-point defeat 12 months ago at the Gaelic Grounds. Dublin go in search of a first final appearance since Anthony Daly led them to glory in 2011, while you have to go back 13 years for Limerick’s last time dining at the League’s top table. It’s a case of déjà vu for the other semi-final as Galway and Waterford meet for the second time in two weeks. The Deise came up trumps in Walsh Park last time out on a 1-18 to 2-13 scoreline in what was their first meeting since the 2017 All-Ireland final. It was Galway’s first defeat in 1B, though they narrowly avoided a major upset against Carlow in round two with the game finishing in a draw. Appearing in two successive All-Ireland finals is an indication that participating in the second tier of hurling has done Galway little harm, though next season’s revamped structure may perhaps alter their approach to the League. Talisman Joe Canning played in four of the five games, though Jason Flynn has stepped in for free-taking duties when required. O’Donoghue has taken a close look at a number of players, though the sight of Cathal Mannion dictating matters from centre-field has been one of the highlights to date. Paraic Fanning’s side have been keeping the umpires busy in the last couple of months, averaging more than 2-22 in their six outings. Against Clare last weekend, they utilised the elements in their favour to turn a two-point deficit into a 14-point hammering of the Banner. The Bennett brothers have been a thorn in every defence they have faced, plundering 6-74 between them, while Tommy Ryan is also thriving in more expressive attack. Just a goal separated the sides the last time they clashed in a league semi-final when the Tribesmen won out in Thurles and most expect another closely-fought encounter at Nowlan Park.